The short version: Rod Price aka RiverSlayer and I completed the 2014 Texas Water Safari. A great race with a long tradition. 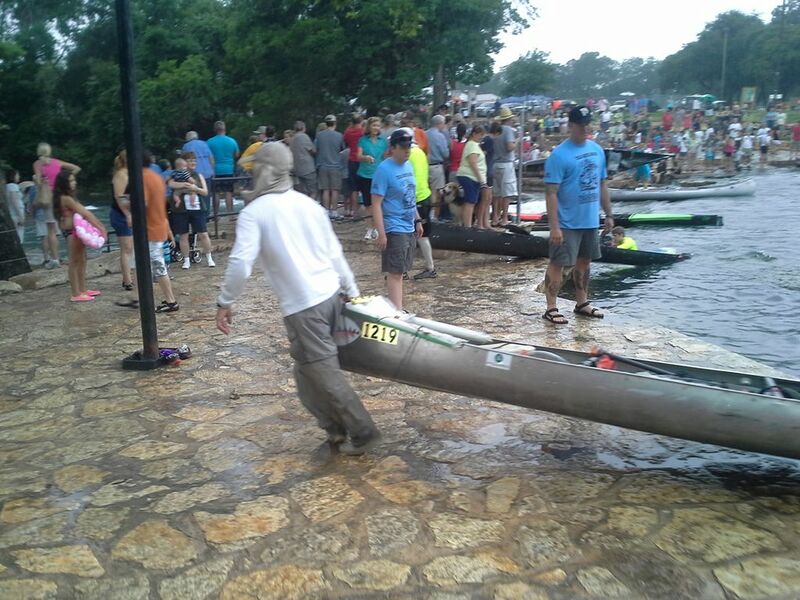 This was the 52nd running of the race which begins in San Marcos and finishes in Seadrift. The course runs on the San Marcos River, Guadalupe River, and salt water bay. Rod and I were in the rookie division (they call it novice) and placed 2nd in our division and 36th overall out of 104 boats with a time of 71 hours 29 minutes. Most importantly we had a great time running a challenging course. We met some really friendly people and would do it again given the opportunity! Now for the full story………. The Texas Water Safari has been held since the 1960s and is a huge part of the river community in the area. Its billed as “The World’s Toughest Canoe Race” which Rod and I initially took with a grain of salt considering we had done some longer races. Especially Rod. The difference with this race is that it has lots of class 2 rapids, at least one class 3, countless sweepers, several dams that require portaging, several log jams that require portaging, an open water bay crossing usually with a stiff sea breeze, and then hot summer Texas temperatures. Still with all of these tough conditions the race draws about 100 teams. Everything from solo to six man boats. The boats are standard fiberglass and aluminum recreational canoes, C1 and C2 racing canoes, to purpose built 6 man carbon fiber racing canoes. So why do this race? Especially if you live in Florida. Its a long way to go when there is plenty of water and opportunities to paddle or race locally. I can site a few reasons. First, if you watch the youtube videos and follow Texas Water Safari on Facebook you will see everyone is having a really good time. (At least if your idea of a good time is being in a canoe even if it means suffering a little). Second, there are a few major distance canoe (paddle) races held in the United States. 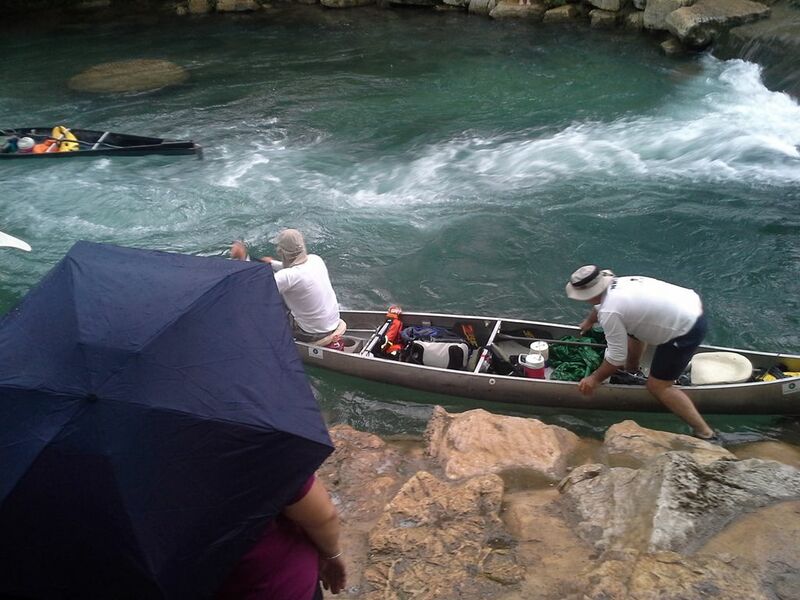 The AuSable, the Watertribe Everglade Challenge, MR340, and the Texas Water Safari. Each has its own appeal but the Texas Water Safari sets itself apart by having moving water with lots of obstacles in your way making for a really fun and challenging course. My final reason is personal. Its about having an adventure. For many of us there is a calling to go see something new. Something outside our comfort zone. Travelling to Texas and jumping into a 260 mile race never having seen the river before is an exciting proposition. Doing these types of trips makes working a regular day job the rest of the year tolerable. Its the type of adventure that gives you something to look forward to each day until its upon you. While talking at the finish of the 2014 Everglades Challenge Rod Price mentioned that his next big race would be the Texas Water Safari. My response was that I was interested in doing it too. Originally my though was to go solo. Rod was looking for a partner and had done his research. He wanted to enter the rookie (novice) division since you can only do it your first time entering the race. This meant using a standard canoe. Preferably aluminum for durability in the rocky rapids and on the portages. I was concerned that my paddling was not that great. Certainly no where near the level of Rod’s paddling. While I had done 50 – 70 mile paddles and some longer trips where I combined paddling and sailing he had completed most of the major distance paddling races in North America and some internationally. So I told Rod that we needed to paddle a few times together to know if we would be able to do the race together. Somewhere in April our team was formed, we entered the race, and rented the canoe from a Texas outfitter named Paddle with Style run by Holly Orr who is a successful racer herself. Workouts went well. We were paddling 2 hours once a week on Wednesday nights, sometimes up to 20 miles on the weekends and we completed our training with 67 mile overnight paddle on Suwannee that even included portaging at Big Shoals. I supplemented my training with gym workouts and Rod was paddling on his own some more too. 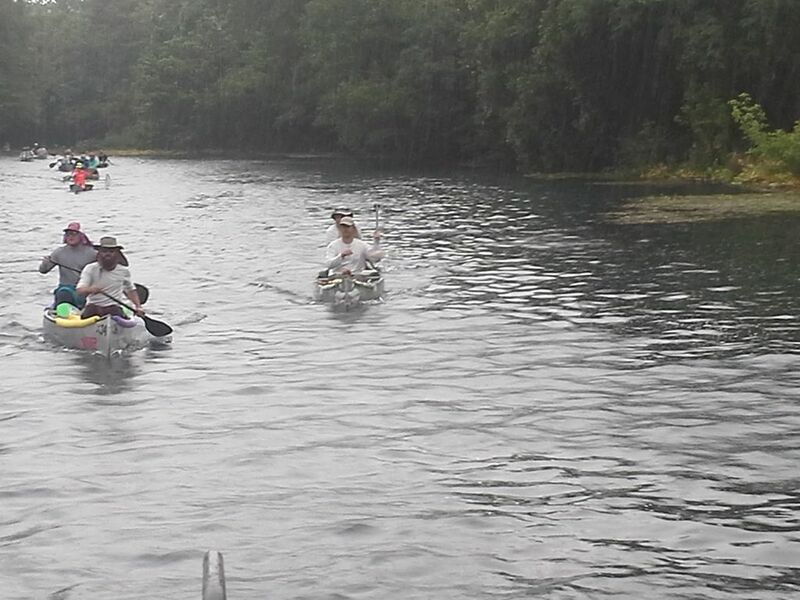 Besides paddlers the Texas Water Safari requires that you have one or more “team captains”. The responsibility of the team captain(s) is to check you in at each of the ten race check points. Provide you with food, drinks, water, ice, and medical supplies but no other equipment such as paddles, lights, camping gear, repair items, etc. The team captains have a tough job. Trying to get to the check points and to some of the other accessible points along the course means driving long distances sometimes in very rural areas, living out of the car for multiple days, and boring long waits as the races make it down the course. Having a good team captain can make or break you. Originally Rod’s girlfriend Stacy was to be our team captain but work kept her from being able to make it so Rod was able to get his friend Ed Morris to join us. Ed was an awesome team captain. A super tough outdoors man and triathlete with a great attitude. The Friday before the race is check in day. After flying in and traveling from the airport we arrived at the pre-race check in and meeting around 2 PM. This was our first introduction into the Texas Water Safari world. While I eyed a class of canoes the likes of of I had never seen before we began to prepare our gear. The first order of business was finding an official to review our mandatory equipment. We had all of our gear, Coast Guard approved aerial flares, first aid kit, snake bite kit, PFDs but one rule surprised us. You were required to have a communication device such as a mobile phone but it would have to be sealed to prevent use. This was an unforeseen hiccup in my plans. As an iPhone junky my phone was also my still and video camera, backup GPS, access to the Internet for Facebook updates and more. I was not happy with the rule but we had to comply. So I resolved myself to no having this modern day luxury item. The next step was to list all other items you were bringing on the race. My understanding of this is that race officials want to prevent entrants from receiving equipment along the course so they make you inventory EVERYTHING. This became an unnerving task as we listed our dry bags, sleeping equipment, repair kit items, go pro, wallet, etc because we were told that we would have to check in our inventory at the end of the race. Anything in the boat that was not on the inventory would be grounds for disqualification. YIKES! One fun bit of pre race preparation is that most of the experienced racers will get their boat prepared and leave their gear in the boat overnight. To prevent tampering they wrap their boats with cellophane. That way nothing disappears (or gets added). I believe the only exception being a food bag so that raccoons in the park don’t raid the boat. We didn’t know this trick so we took all our gear home for the night. Finally when inventory was done we hung around for the race meeting. Standard stuff but with one good bit of news. The water in the river was up a bit making it more manageable and there were less log jams in the river. Probably three. After the race meeting we set off to scout Rio Vista Rapids. It was important because we were on the fence about running the barely class 3 rapid. It was decided that we would use an abundance of caution an portage. Our highest priority was to finish the race. Taking unnecessary risks was not going to be in our plan. Saturday morning was race day. Official start time was 9 AM. Rod and I loaded the boat in the water around 8:30 AM and were felling pretty confident. The start was fairly standard and we started with a steady pace not trying to burn out right away. A 1/4 mile up from the start is the first portage. We had no clue where was the best spot so we followed a bunch of competitors through the middle. It was very congested as everyone converged and we were held up slightly making our way to the other side. In hindsight I wish we would have put our canoe in the water around 8 AM and paddled down to this first portage and scout it better. We would have had time to pick our line instead of following the pack. At the 1 1/4 mile mark is the famous Rio Vista Rapids. This is probably one of the best viewing spots for the race. Everyone is coming through quickly. Some run the rapids, some have extra team members jump out to portage while one or two take it through the rapids, some portage the whole thing. We were playing it safe and took the boat out above the rapid on the left. Already on our second portage I was noticing that a relatively heavy recreational aluminium canoe was going to present its own challenges with these portages. The weight was not trivial like the carbon boats used by the other divisions. Rio Vista Rapid was also our first exposure to the crowds that gather to watch and cheer for the race. There were people everywhere taking pictures and video but the crowd yelling encouragement to the racer was awesome and a huge motivation boost. Based on my pre-race planning we went to the left and avoided Thompson’s Island Dam. We almost made a last minute decision to portage there because others around us were going that route but it was congested so we stuck with our original plan. It turns out that the left channel to Thompson’s Island Road Bridge is slow water so this probably cost us some time but we were able to portage without having to wait on other racers. Next up was Cummings Dam. A formidable drop with a portage to the right. This is where we got to see another team with an aluminum canoe school us on how to do the portage quickly. As we pulled up with the intention of taking our boat out of the water they lifted theirs on to the dam and lowered the boat down quickly with bow and stern lines. It was absolutely impressive. Our portage took about 5 or more minutes but theirs was around 90 seconds. It would take us quite a long time to catch back up to them. By this point racers were starting to get spread out on the course. Rod and I were beginning to understand how difficult things were going to be. There wasn’t a lot of long strait paddles. There always seemed to be logs or rocks in the water that needed to be avoided. Portages required large amounts of physical exertion. Next up was Cottonseed Rapids. A class 2 rapid with lots of exposed rocks. I picked the wrong line and we ended up stopped with the center of the canoe on a rock. I then made the mistake of jumping out of the boat thinking I could get it off of the rock but what happened was the stern settled further into the water, caught the current and spun the boat 180 degrees. With the boat still on the rock and Rod in the stern facing the wrong direction the boat became less stable and (probably) in fear of tipping over Rod jumped out. Whoops! The crowd on the bank cheered at our less than graceful antics. At least the boat stayed up right so we quickly got it turned around, jumped back in and proceeded on our way. The next major obstacle was Martindale Dam. Here again we were schooled by the locals. As we went to the right to portage they went strait up to the dam and over. The person in the bow jumped out and slide down the face of the dam. The person in the stern got out and lowered the canoe down the dam with the stern line to the bow person and were gone in a blink of the eye while we spent 5 minutes or more carrying our canoe around the side. Saturday 12:28 PM – The first of the 10 race checkpoints was next. Staples Dam was our first opportunity to see Ed, our team captain, and another portage. Staples dam was bit of confusion for us. Ed was on the left bank and we followed the original race instructions to portage on the right. So we never really got a chance to see him. Again the locals had fast methods of portaging the dam by going over and using the structure to their advantage. We continued to stay conservative and portage as advised in the race instructions because it was our planned strategy. The race after Check Point 1 begins to be more drawn out. The trip from Check Point 1 to Check Point 2 was much less eventful. Still lots of obstacles and current but it was our opportunity to find a groove and click off miles. Another bit of good fortune was that the sky was primarily overcast keeping the temperatures tolerable. At this point I was beginning to have some body management issues. My hands were water logged from pushing too hard and would need to dry out or end up getting torn up. I carefully changed my stroke so that my lower hand would stay mostly dry. Saturday 5:05 PM – Check Point 2 at Luling 90 bridge was again full of people cheering on racers. It was also the first really good spot to meet up with Ed. He resupplied us with water and a snack. We asked what place we were in for our class and was informed that we were tided for 2nd. He had seen the first place team at Check Point 1 and they were well prepared for the portages. They were completing them in the same manner as the expert teams and had 40 minute lead on us. We didn’t stay at the check point long. We left ahead of the other team in 2nd and started thinking about travelling at night. Next was Luling Zedler Dam. At this point I will have to profess to my memory getting a bit foggy. It was another tough portage but at least it was still light out. Ottine Dam was our first night time portage. We were somewhere around 40th place overall. The take out was a slick 6 foot high mud bank with some roots. Rod and I were able to get out of the boat with no issues but when dragging the boat up the bank I lost my footing like slipping on a banana peel and landed flat on my back. It was a bad enough fall that the boat waiting to portage behind us asked if I was alright. I was lucky not to slide back down the bank and end up in the water. I was also lucky not to have any injuries from the fall. Just a little bit of pain. If I recall correctly Palmetto Bridge and Park was a low bridge where we portaged the boat up onto the bridge and met with our team captain Ed. No major issues just a resupply and go. It was in this section of the river we encountered our first log jam. We were traveling with another 2 man team and the 3rd place team in our division was not to far behind. We made a huge mistake by thinking we could slide through the log jam on the left side. Upon entering it we came right next to a floating dead calf that stunk badly! Enough to make you want to puke. At this point we were committed and pushed another 30 ft deeper into the log jam. The 3rd place team arrived and upon seeing our lack of progress went to the right hand bank to portage. Rod and I struggled in the log jam for several minutes as we were passed by the other team. We watched them successfully portage and continue on when we decided it was time to turn around and follow their route. We probably lost a good hour with this mistake. I also think I picked up poison ivy at that is portage on my wrist and legs but that wouldn’t start becoming a problem until after the race. The remainder of this leg of the race was uneventful. There was some current and there were logs in the water to avoid but most of the time it was just paddling and dealing with the nausea from smelling the dead cow. Just before Gonzales Dam we completed the San Marcos River and entered the Guadelupe River and the current increased. Before Check Point 4 was Gonzales Dam. One of the larger ones on the river. Before arriving at it there is a lighted sign warning you to get out. We portaged on the right as described in the race documentation. We were a little confused on where to put in. A race official sleeping told us most were going strait down the rocky side and putting back in so we followed the advice. It turns out this was the more dangerous path. The rocks were large. Anywhere from the size of tool box to large cooler. They would move a bit and you had to careful with your steps. Once all the way down you were in a briar thicket. It was fairly low so they didn’t bite too bad. Sunday 4:30 AM – Gonzales Gravel Bar was a busy place. Lots of racers were stopping here to rest. Rod was feeling tired and went to lay down for an hour. I was still pumped up with adrenaline and stayed up with Ed. I took the time to clean the mud out of the boat and off of our seats from the previous portages. We had also broken our bow light off in the dead cow portage. I had made the original out mount out of foam and duct tape but now the boat was wet so I re-secured the foam mount with some bungies that I cut up. I also noticed my next health issue. My rear end was beginning to get raw. Not a fun subject and gross for non-racers but a fact of life for distance paddlers. The issue was fairly serious I had rubbed the top layer skin off but not being able to see I figured it was just a rash at this point and covered it with Desitin. The same stuff used for baby bottoms. This helped a lot and probably minimized further damage. We left Gonzales around 6 AM at first light. We saw the other team in our class that had passed us at the dead cow log jam. They were still on the gravel bar resting. (This would be the last time we was them as they were slowing down a bit and we were keeping our pace). The leg from Gonzales to Hochheim was uneventful. We had a good feel for the river. There were a few sweepers and a couple small rapids but for the most part it was an uneventful paddle. Sunday was a hotter day and I found myself dipping my hat in the water too cool off. Sunday 1:38 PM – Hochheim Bridge was the first of some tough check points for our team captain Ed. It was a steep bank making resupplying the boat difficult. Ed had mentioned that he wasn’t getting any sleep. Rod took a bio break at this spot and I jumped in the water for about 5 minutes too cool off. Not thinking I went swimming with no foot protection and felt the big tow on my left foot brush up against a sharp piece of glass. Broken glass under a bridge? Duh… Should have seen that one coming but luckily it only took off the surface skin and didn’t bleed. It was around this time that we learned our nickname was now Team Sharknado because of the teeth on the front of the canoe. The 3rd place team’s captain referred to us by that name and asked if we had seen their guys but we told them no. They also mentioned that their SPOT Satellite Tracker wasn’t working so they didn’t know where they were at. Sunday 7:14 PM – I don’t remember the Cheapside Bridge very well. but at this point in the race we had passed the half way mark. A great milestone to boost our morale. This could have been the spot where Ed scraped up his foot and knee trying to deal with the steep banks at the check point. He was still not sleeping. By this point Ed and I were both extremely sleep deprived too but I was feeling ok. We were talking about where to stop next. As the sun set I was having an extremely difficult time seeing the river in those final moments of dusk where its too dark to see but too light for the flash light to work effectively. Once it was dark we met up with Pete Binion. We had said hello to him earlier on the river but moved on quickly. This time we chatted a bit more and discussed the idea off running together for a while. A lot of the details are a blur from sleep deprivation but if I recall correctly Pete enjoyed travelling with us because we were on the faster end of his regular pace so it kept him moving along at a good pace. The opportunity to talk would help keep everyone awake. The plan further developed into sleeping on a bank or bar somewhere past our next check point but before some of the more technical rapids and sweepers in the next section of the river. The plan had its benefits for us too. We would be able to travel with someone who knew the course. Especially the big log jam further down the river. The locals knew a fast way around it. On our own we had the potential of spending hours dragging our canoe through trees and other ugly stuff causing us to fall way behind. So travelling with Pete was a big break. Sunday 10:30 PM – Here we made a quick stop and informed Ed that we would be getting an hour or two of sleep somewhere on the river. I have very little memory of this stop. The sleep demons were beginning to creep in and during the next few hours of paddling it was difficult to keep my eyes open and my brain focused. So it was a welcome break when before the Thomaston Bridge section of the river we pulled over on a high gravel bar in the middle of the river for a 1 – 2 hour nap. Pete had a good schedule and sleeping at this location set us up for the next day. Pete and Rod decided to put me in charge of waking up so I set my watch for 3:30 am. Well….. I missed that alarm but luckily only by a little bit. We were up by 4:00 and back on the water 15 minutes later. The schedule was still on track. Running the rapids around Thomaston Bridge at night was exciting. We stayed a safe distance behind Pete but followed his line through each one. We didn’t know it at that time but the water level was up even more. Somewhere up river they had received rain and we were benefiting from it. The extra current was good for our pace but the sweepers were more dangerous. Rod and I had good strength and could muscle though all of challenges but I wondered how some of the smaller teams were fairing. Here is a video from that morning. The GoPro battery was not doing well so this is all I was able to get. Monday 10:37 AM – By the time we got to Victoria City Park Boat Ramp we had learned that it would make sense to get rid of all of our non essential gear. It would help with the log jams but it was essential before crossing the bay. We notified Ed of this plan while he continued to supply us with great food. At this point we were on our 3rd or 4th Subway sandwich, cookies, Snickers bars, fresh fruit, Cokes, Monsters. He was taking really good care of us. The trip to Victoria Port Authority (Invista/Dupont) was uneventful. The river was beautiful with huge cypress trees lining the banks. We had to negotiate more sweepers but everything went well. Rod and Pete spent a lot of time talking. They had both been in the canoe racing community for a long time and had many mutual friends so time passed quickly. Monday 5:52 PM – At Victoria Port Authority we elected to keep our gear just in case. By this point we knew what we had to portage and we could handle it. We also knew that with Pete in the lead we were going to take the side cut and not have to do the worst portage. Ed was holding up well and the finish was not too far off. We continued on to the first log jam. It was just before the rail road bridge. The take out was another steep 5 foot incline but things were clicking for us. Pete was fast but we were not too far behind. We made it to the 2nd BIG log jam just before dark. Pete scouted the portage into the side creek and we were off. The side creek had good current! I watched my GPS as we paralleled the river for about 3 miles. The side creek was fun. The current had a perfect pace for negotiating the tight areas but not having to paddle hard. This was our biggest break of the race. Monday 10:58 PM – We had arrived at our checkpoint the Saltwater Barrier. Pete elected to continue on down the river on his own. Rod was wiped out and found a quiet spot to get some sleep. I worked on cleaning out all of my non-essential gear from the boat and preparing for the last leg of the race. It only took me about 45 minutes to get ready and after a few minutes of talking with Ed I fell asleep too. We got up around 2:00 AM. Since we had good light under the bridge at the check point we elected to put the spray skirt on the canoe. We soon found out that the spray skirt didn’t fit properly. It was too small. I theorized that it was due to shrinkage from long term storage but it wasn’t right. We were able to secure the front of the skirt but the back was not going to work. We used duck tape wrapped all the way around the boat and a garbage bag to make it work. It was a heck of a rig job but it was all we had to work with. We left the check point around 3:00 AM. This would put us at the bay at first light. We hoped that it would also be the lightest possible winds for making the crossing to the other side but it wasn’t to be. We entered the bay with a good 15 MPH wind. We followed the advice we had been given by other competitors and hugged the shoreline until we had to cross over. At Foster’s Point we had to commit. Also motivating us to make our move was a 10 foot gator on the point and no more than 50 feet from our canoe. Rod being the experienced paddler was giving me advice and encouragement as we fought through the chop. It wasn’t terrible in the bay but that was mostly because Rod was keeping us at the best possible angle to the waves. We were relieved when we were across and pulled into a protected shore line to bail the boat out. So far so good! Next was to cross over at the barge canal. There was a bit more chop in this area I think due to a current coming out of the canal. Rod spotted a big fin. I saw it but couldn’t identify it. Because it never came back up I suspected Rod was right when he thought it was a shark. A dolphin would have reappeared near by. Past the barge canal we experienced a new issue. There was a sea wall reflecting the bay chop and making it worse. At this point Rod was very concerned about the amount of water we were taking on. The GPS showed us with 1/2 mile to go and we were in a bit of trouble. Sinking was looking like a real possibility. Rod gave me directions to keep paddling and we clicked off the remaining distance. Once we spotted the finish we turned 90 degrees and started paddling strait into shore. With only 100 yards left we were going down! Everyone on shore was yelling and cheering for us. The chop got worse from the sewall as we got closer and at about 40 feet to go we finally had too much water in the boat and we flipped. But we were at the finish. The water was 3 feet deep and bottom solid. We stood up and immediately celebrated. High fives and a hug were in order. We just completed the Texas Water Safari in 71 hours and 29 minutes. Second place in our class and 36th overall out of 104 boats. I have to admit that I had heard stories that Texans didn’t like outsiders and some people I knew had bad experiences. My experience couldn’t have been more different. Everyone we met in Texas from the TWS officials, volunteers, participants and spectators to the airport employees, and TSA agents (yes! the TSA agents) were amazingly friendly and nice. I was blown away by the hospitality and am humbled to have my original assumptions blow away. Many Texans were noticeably humble and soft spoken. I am sure we came across as loud and abrasive but always remained nice. The part of Texas we saw was beautiful. One assumption was confirmed. Texas is big but its also beautiful. We were fortunate to see tons of wild life. There are deer and hogs along the river. Great birds too. Pete even pointed out a lesser heron. A species we don’t have in Florida (I think???) The cypress trees lining the river were amazing. The rapids made the river exciting. I hope to be back soon and highly recommend going to Texas if you get the opportunity. Thank you to everyone who helped us with our race. Family, friends, race volunteers and people we met along the way!!!! This was a special trip. Thank you for your part! Special thanks to Rod Price for talking me into this crazy race! It was a great time. Electrolyte Pills – Rod brought these and shared them with me. I was unaware of the importance of these in ultra long distance events. These were our main supplement to keep our bodies hydrated. Knowing Your Distances – It was a long race but it was manageable by knowing total distance travelled, distance to next checkpoint and distance to next major landmark. Without it the race would seem to go on forever. GPS Tracks – You can program routes and you follow tracks. Programming a route doesn’t work for a windy river. Following a preloaded track worked great. GPS Trip Odometer – Important to track mileage. Our distance tracked was slightly higher than the official race distance because we were moving from one bank to the other riding the current. This usually meant doing small amounts of math to accurately estimate distance to next check point. Thermarest and Bivy Sack – If you knew the course extremely well you might be able to have one person sleep in the boat while the other kept it moving but there were way too many sweepers and rapids for us to know where we would get away with this while on the river. We ended up taking three one hour breaks. The sleeping equipment was essential. Duct Tape – We brought a whole role and used more than 1/2. Before the race we used it to tie on emergency water bottles and build a mount for our bow light. During the race we used it secure our spray skirt that didn’t fit the boat properly. I highly recommend having a role in a rental canoe. Large Billed Hat with Flaps – The pics make me look pretty dorky but after 3 days on the river I had no sunburn. Flying home on Tuesday evening – Originally I though we would easily finish on Monday. In hindsight this is highly unlikely without expert knowledge of the rivers and portages. We got off the water Tuesday at 9 AM. Skipped the awards ceremony and rushed to the airport to make a 6:00 PM flight. It would have been better to just schedule it for Wednesday. Bow Lights – Ours were high powered and long lasting but they didn’t throw up a wide beam. The teams with good lighting were at an advantage. Some were doing it with handheld flashlights and others with aftermarket car lights. Looking back we didn’t test this part of our equipment prior to the race. This was a mistake. Water Tight Spray Skirt – Ours had some issues. Make sure you test fit it before the race. Also a whole role of duct tape and a couple garbage bags can help in a pinch but you better be prepared to bail water. Especially in the bay.